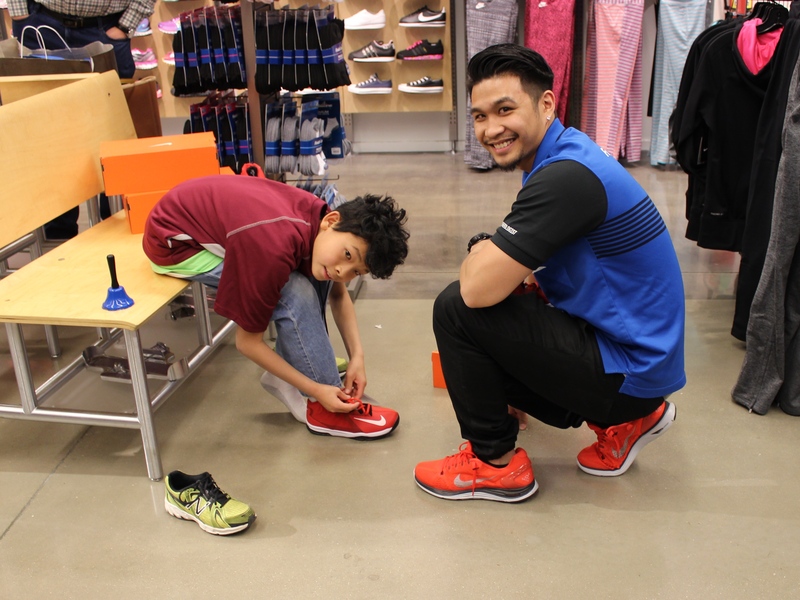 On #GivingTuesday (Dec. 2), 20 Special Olympics Illinois athletes were invited to the North Riverside Mall and Fashion Outlets of Chicago Finish Line locations to be fitted for a new pair of athletic shoes up to $125. All the athletes were introduced as they ran through a huddle of chanting and cheering Finish Line employees, then each athlete paired with a staff member who took care in finding the perfect pair of shoes. The athletes ran around the stores picking out apparel with their leftover money and modeling their new kicks – posing for photos and practicing their jump shots. 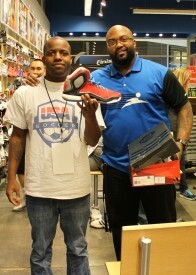 View photos from Finish Line event. One of the athletes selected was 11-year-old Aidan Toy who participates in 12 different sports with District 54 Schools in Schaumburg. Along with having autism, he also has asthma. Aidan has two younger brothers who also have intellectual disabilities, a brother with developmental delays and a sister with Down syndrome, and his family has struggled since he was born. Being raised primarily by his mother, with his stepfather no longer in their lives, the family had found themselves without a home. For the past 6 months they have been living with a family friend, and two weeks ago they were finally able to rent a place of their own. During this time Aidan has never complained or asked for anything, his coach says. Recently Aidan came to practice in shoes that were much too large and not conducive to playing basketball. Despite the difficulty created by his shoes, he remained positive and eager to participate. When the Finish Line store manager told Aidan that he only had $25 left to spend, Aidan picked out a pair of shorts for himself and a T-shirt for his Secret Santa. Aidan then told his coach that he wanted to spend his money on his Secret Santa who always bought him gifts, but never had the money to reciprocate. The store manager overheard the story and decided to buy, with his own money, two shirts – one for Aidan and one for his Secret Santa. Aidan did not stop smiling the rest of the afternoon. After hearing the story, another store manager bought Aidan a Chicago Bull’s hat. Aidan was so excited he asked his coach if he could change into his new clothes. Michael Henderson, a member Illinois’ soccer team competing at the 2015 World Summer Games, shows off his new shoes. This is just one example of generosity exemplified by both the Finish Line staff and Special Olympics Illinois athletes. We can’t thank the many store managers who showed up, cared about and respected the athletes so much and made their day so very special on top of the already amazing gift donated by the Youth Foundation. 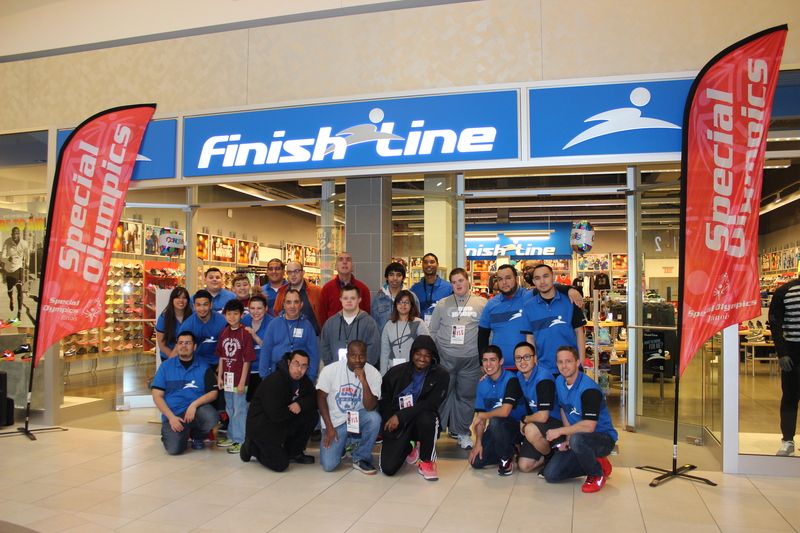 We are so honored to have a partnership with the Finish line Youth Foundation and all of the Finish Line stores. 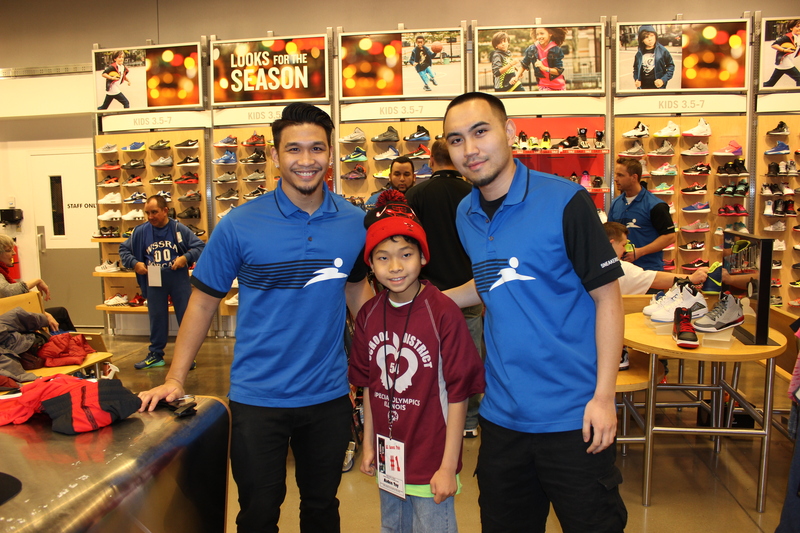 The Finish Line Youth Foundation will continue to donate funds collected from customers in over 600 Finish Line stores through Dec. 31.